A period of clouds, chance flurry. Highs in the teens, wind chill around zero. Overnight Friday: Clear early, clouds return late. Lows in the 0s. Most of the region had high temperatures in the single numbers and teens yesterday — record cold high temperatures for Dec. 28. High barometer last night meant low thermometers this morning, with radiational cooling with some of the valley locations cooled to 20 to 30 degrees below zero in northern New England. That happens with a clear sky, light wind, and a deep snow cover such as we have from the Northeast Kingdom of Vermont through the Mount Washington Valley. Today we finally see the storm that went by Christmas Day releasing its grip on New England. That will allow for high pressure and lighter wind. Temperatures also get slightly less cold. High temperatures in the single numbers north and teens south. Wind from the northwest at 5 to 15 mph makes for a more tolerable day. A weak low pressure system crosses southern New England with the snow developing south and west tomorrow. We will remain cold and dry for most of the north. Tomorrow night we may see light snow accumulate 1 to 3 inches south of the Massachusetts Turnpike, and perhaps 5 inches or more and parts of Cape Cod through Sunday morning. When that weak system gets out over the ocean it will intensify rapidly causing the wind to increase again on Sunday with temperatures holding near 10 degrees once again. New Year's eve looks to be about as cold as they get, with temperatures close to zero degrees at midnight and the wind will still be 15-20 mph from the north, adding a wind chill factor well below zero. 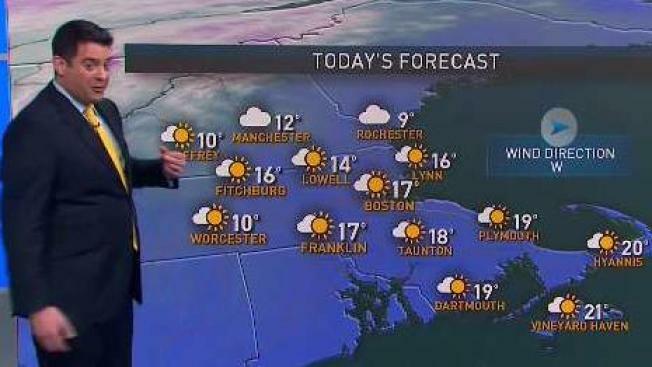 New Year's Day Monday looks like sunshine with a high temperature near 10 degrees. Wind may still be gusting past 30 mph. Strong high-pressure comes in for Tuesday and Wednesday with sunshine and well below normal temperatures, mostly sub-zero at night and in the single numbers and teens by day. Then our attention turns to a storm which will be bringing snow to the southeastern United States. It will turn up the coast perhaps for a major nor'easter here the second half of next week. The timing on that looks like about Thursday or so. It could be big, but we will cross that bridge as we get closer.